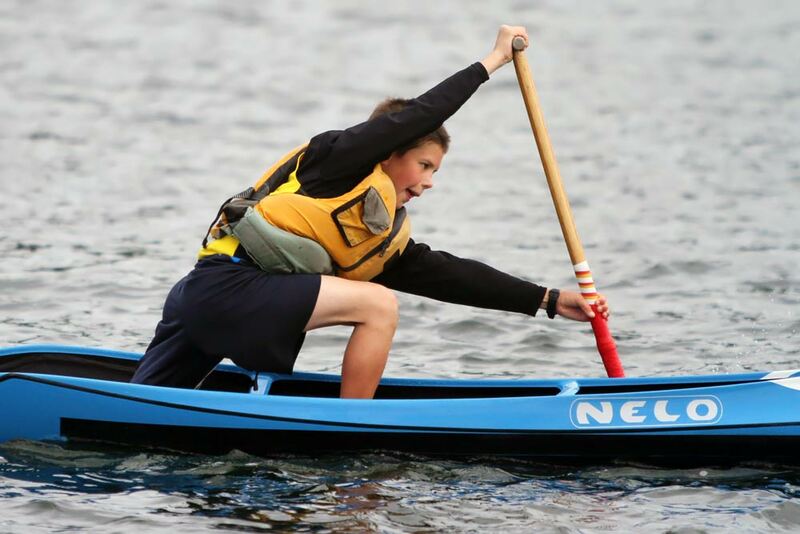 The Gig Harbor Paddlers Cup returns to the Gig Harbor waterfront on April 11 and 12. The annual event will feature competitive paddle racing for kayaks, canoes and SUPs, as well as outriggers and paracanoes. Proceeds benefit the Gig Harbor Canoe and Kayak Racing Team. Before there were steamboats, ferries and bridges, just how did everyone get to town? They rowed. The Gig Harbor Paddlers Cup celebrates this important part of our Peninsula’s history with the return of the Heritage Row, now renamed the Heritage Classic. Paddlers will start at Jerisich dock and paddle across the Narrow’s to Owen’s Beach at Pt. Defiance and back. The route is approximately six miles round trip and this event will take place on Sunday. The Heritage Classic is also part of the new Seafair NW Paddleboard Series. The top three male and female finishers will qualify to compete on the hydroplane course at Seafair in August. More information about the Seafair NW Paddleboard Series can be found at www.nwpaddlingseries.com. The Corporate Dragon Boat Races will include corporations, public service groups and clubs sponsored by small businesses and high schools. Participants of any level of fitness can quickly adapt to and develop a passion for this sport — no experience necessary. 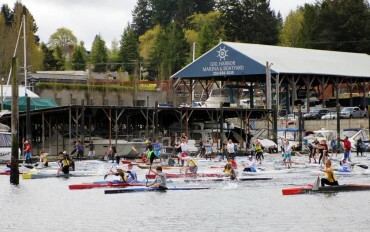 Boats will be provided by the Gig Harbor Paddlers Cup. This event will take place Sunday. 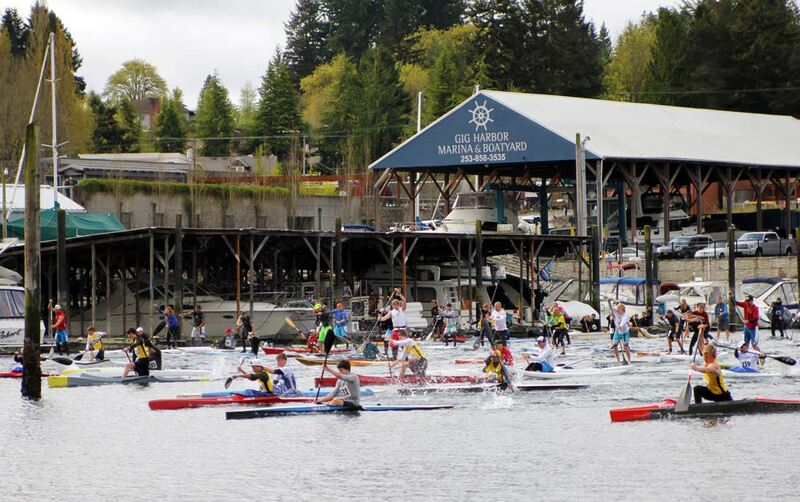 The Gig Harbor Paddlers Cup will be based at Skansie Brothers Park and Jerisich Dock in the heart of historic downtown Gig Harbor, with Saturday sanctioned event races taking place inside the harbor. See the schedule of events for the two-day event as well as the course layout at gigharborpaddlerscup.com. Visit vendors and booths with informational displays on water sports and equipment at the park while the races are taking place. You will also have the ability to try out equipment, view new boats and learn more about paddling sports. For registration information for competitors, vendors and dragon boats go to gigharborpaddlerscup.com. Special rates are available at Gig Harbor area hotels for participants. For additional information, email gigharborpaddlerscup [at] gmail [dot] com. Major sponsors of the Gig Harbor Paddlers Cup and Expo are The Skin Cancer Center; Kim Rioux, DDS; Heidi Rowntree Realtor; the city of Gig Harbor and Tacoma South Sound Sports Commission. Additional support comes from Peninsula Light, Downtown Waterfront Alliance, Thrivent Financial, Timberland Bank, Umpqua Bank and the Gig Harbor Canoe and Kayak Club. Known as the most picturesque harbor in the Northwest, Gig Harbor is an easily accessible, relaxing destination with lots to see and do. Gig Harbor offers shopping along the waterfront as well as uptown, fine and casual dining, and overnight stays in small to mid-size inns and bed and breakfasts. Yachting is big here with private marinas and a public boat dock. Kayak, paddleboard and boat rentals are available as are harbor boat tours. The community’s fishing village heritage is evidenced at the Harbor History Museum and public landmarks. Several top golf courses including Chambers Bay and Gold Mountain are a short drive away, while trails, parks and charming neighborhoods invite walking and cycling. For additional visitor information on Gig Harbor, Washington’s Maritime City, please access www.gigharborguide.com.